I do 3D printing, and sometimes I do large or complex 3D prints. 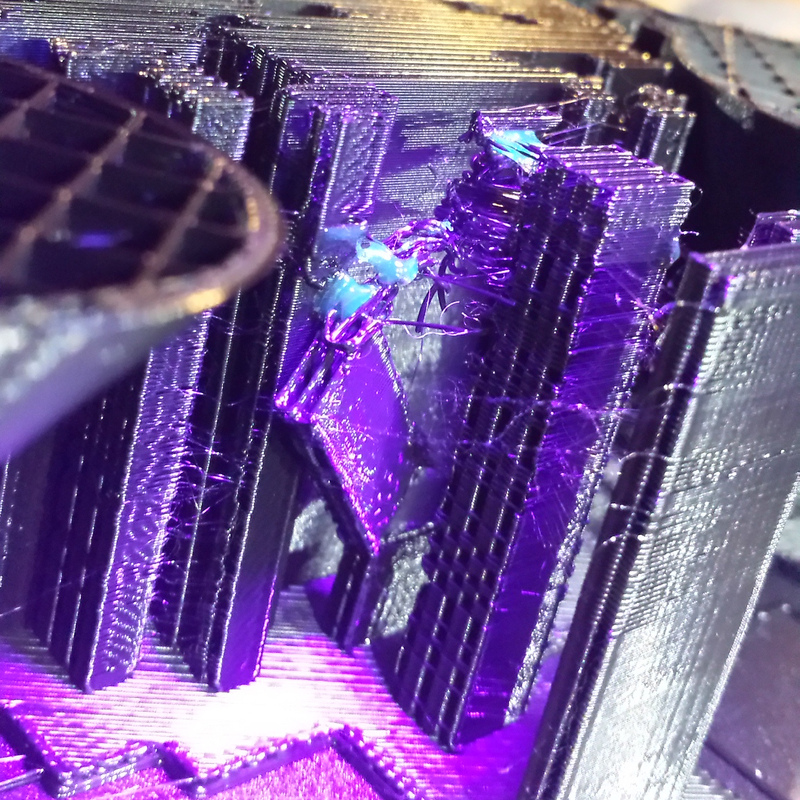 In these, there are sometimes large support structures as part of the print. These are breakaway pieces that support parts of the model. They are intentionally fairly fragile - they are only as stiff and as thick as they need to be. They are made to be strong enough to do the job, but also fragile enough to be easily broken away. Unfortunately, sometimes they break accidentally during the printing process. Maybe the print head pushed in the wrong spot - unwanted things can happen over 24 or 50+ hour print jobs. It's bad news, because at worst it means the job is ruined. All that time and plastic so far might be down the drain. On the left is a support column. It looks solid, but it's really just a very thin zigzag ribbon, and the taller it is, the easier it tends to be to snap. I discovered a tool that is really useful to salvage some broken support pieces. On a longer print, all you really need to do is put some support and anchoring back where there is none. If you provide some structure and stability, and the printer has enough printing left to do, then the support should slowly be able to pick up where it left off. If you can anchor things, or at least provide some foundation without interfering with the new layers the head wants to lay down, then you can probably salvage the print. At first I tried to use various glues - but they never really worked. Either they are too hard to do a get-in-get-out application (because you need to dodge the print head), or they are too messy, or they are too hard to apply where you need, or they don't set quickly enough. I eventually settled on a product called Bondic. It's a small dispenser of UV-curable resin. The resin is a clear syrupy fluid that sets hard when it's hit by UV. It hits all the bases for an emergency fix. 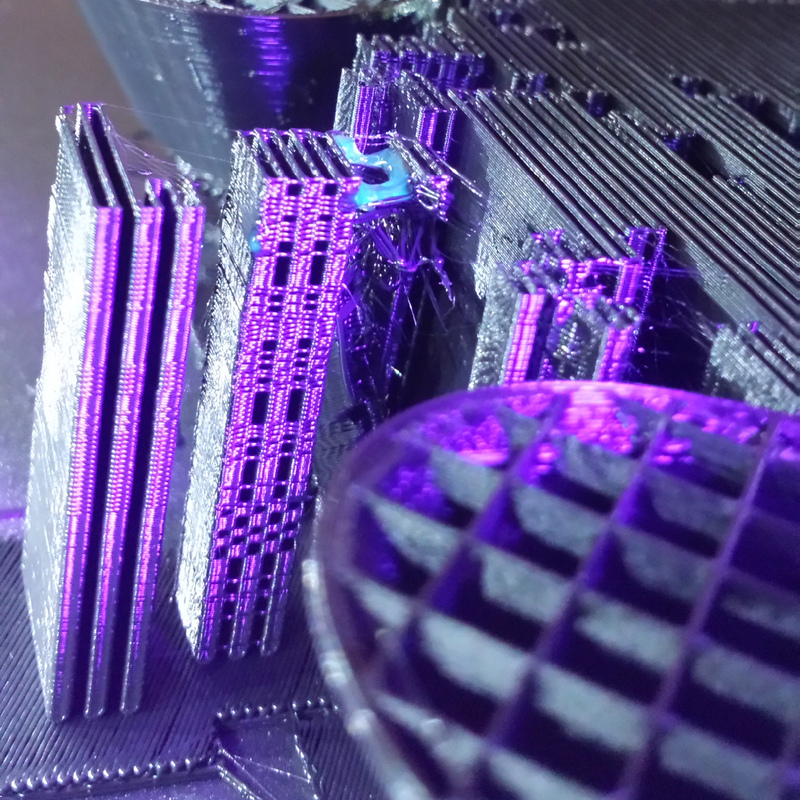 It is very important not to get any of the resin on the print layer where the print head could get contaminated. Only apply to areas that have already been printed. On more than one long print job, I have salvaged a weak or broken support structure by applying a bit of Bondic in the right place. 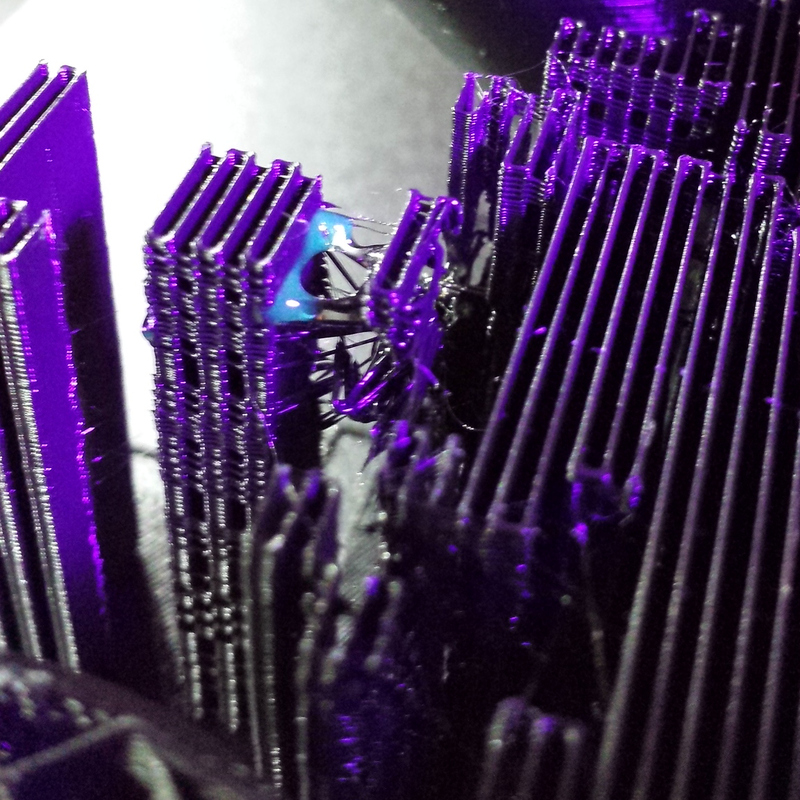 Here is a recent example of providing just enough stability that the extruder eventually re-established the support. In the UV, the resin glows bluish. 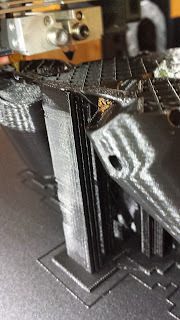 Here you can see the mid-air loose printed filament anchored to the neighboring pillar. Side view, showing the toppled pillar. The top of the broken pillar was anchored to its neighbor earlier. Then, as the "spaghetti" was deposited into mid-air some of it was eventually anchored with more resin. Subsequent deposits got firmer and firmer as a result. 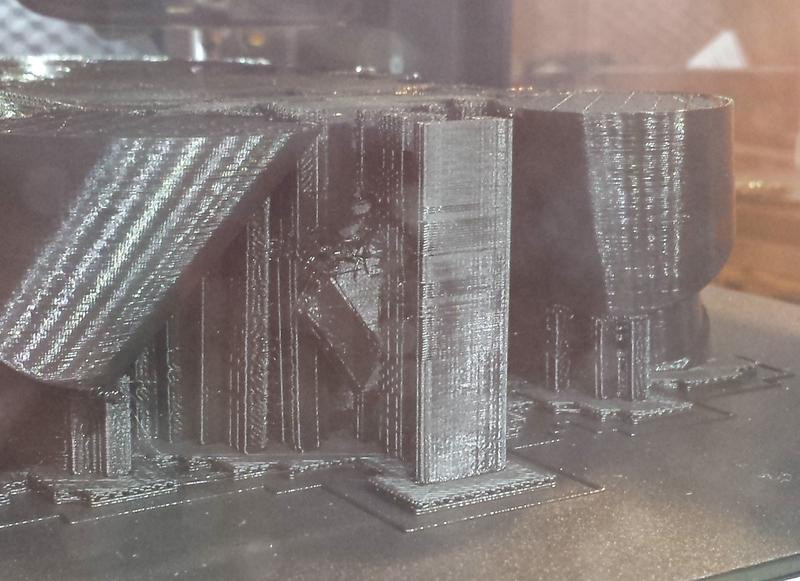 Here you can see that printing has picked up again, successfully! Since this is just support material, it doesn't matter much that things went wrong in the middle - it only really matters how it ends. Side view shows the earlier break, and the subsequent re-established support above it. 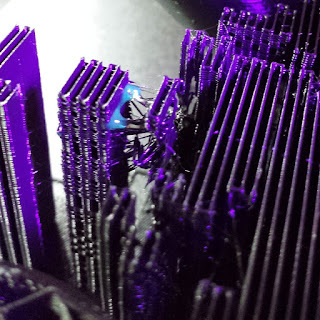 It's not a cure-all, but when babysitting a long-term 3D print and you can see something going wrong and there's an opportunity to spot-fix it, Bondic resin is my sweet spot so far.